"Funk, Antoinette. Co-chairman N.A.W.S.A., 1914." Antoinette Funk of the National American Women Suffrage Association. Mrs. Funk, who was admitted to the Illinois bar in 1899, was U.S. Assistant Commissioner of Public Lands from 1933 to 1939. Harris & Ewing Collection glass negative. View full size. Submitted by WSP on Sun, 11/28/2010 - 3:12pm. I'm distantly related to Antoinette: she's my first cousin three times removed. I've been gathering information about her as part of some research for the history of my family, and I must say she was a remarkable woman. I'm surprised nobody has written about her in recent decades. Submitted by Annie on Mon, 09/20/2010 - 6:14am. She is in a long stiff corset that would be considerd very tight for everyday wear. However, this lady probably thought it "normal / proper / respectable" to wear this style of corset. I was born in the UK in 1945. I remember that one of my teacher when I was 10 had this same posture and shape. Her curves tend to be in one dimension only! My Miss Shillinglaw would have been about 55 or so, so whe would have been 14 at the time of this photo. Perhaps this Mrs Funk would have been a role model for her? Although not comfortable these corsets force you into an upright posture which give the impression of confidence and certitude. This was power dressing in 1914. Submitted by stanton_square on Fri, 11/14/2008 - 5:30pm. What a bundle of internal contradiction! 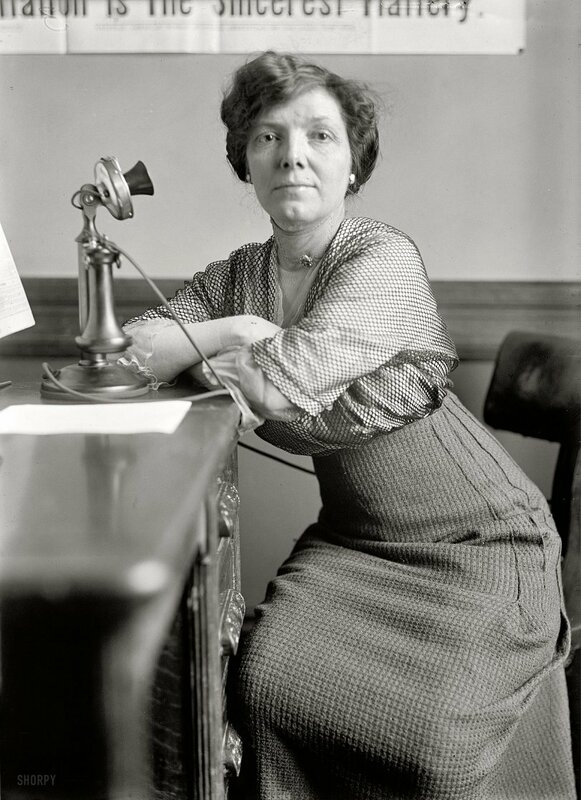 Starting in 1912, there are over 150 references in the Washington Post regarding Mrs. Funk's participation in the Suffragist movement, Liberty Loan program and the Land Office. Back in 1904, however, there is a full length article (below) profiling Mrs. Funk and her law practice in Illinois. In the article she states that women should not aspire to professional careers nor should they have the vote. It's hard for me to understand if she really believed this at the time, or if saying these things was a strategy to soften the "threat" and "scariness" of the advancement of women's rights. In either case, it reminds me of Mary Loomis and her radio school for men only. Advice of a Successful Woman Lawyer to Other Women. Standing before twelve jurors in the Criminal court last week a little woman who does not weigh more than 100 pounds pleaded for clemency in the punishment of a man who had murdered the girl who had jilted him. This little woman, Antoinette Funk, is a lawyer, and the case in which she figured was one of the very few in the history of the State in which a woman has appeared to defend a murder. For a professional woman Mrs. Funk has some extraordinary opinions about women in the professions. She does not believe in it. She is herself a lawyer by accident, and not be design, and she deplores the fact that women ever chose to enter the public or semi-public life. She has been practicing her profession for five years in this state - at Bloomington during the greater part of that time - and she takes great interest in her work, but she says any woman is out of place in any of the professions. "A woman is better off with a few babies at home than in a law office," says Mrs. Funk. "Woman's place is in the home, as it has always been. No change in social or economic conditions can alter that. The woman who enters the profession and assumes the duties and the hardships of public life gets out of her natural environment. The continual and increasing drift of women toward public action is working an ill effect upon society, and the ill will grow greater as the proportion of professional women increases." "I have two young daughters. Both of them were born before I took up the practice of law. I shall do everything in my power to turn those girls from the thought of entering any profession. I shall teach them all the domestic arts, so far as I can, for that is what they should know." "I am just a plain, old-fashioned woman myself. I do not believe that woman should vote, whatever their rights in the matter may be. [emphasis mine] It is the duty of women to preserve the home in the simplest, most sacred state. They cannot do it if they spend their time discussing politics, preparing law briefs, or practicing medicine. Being an old-fashioned woman, my ideas may be old-fashioned - far too old-fashioned - but I think I am qualified to speak with some authority upon the subject of women and the professions." "It is a false ambition which is leading women into public life. Some of them imagine, perhaps, that they have some public function to perform, but I do not know of one whose work could not be done as well by a man. When a woman enters public life new worries come to her, and worries are something that she does not need. That is one reason why I, for myself, object to women's clubs. I am not a member of one and I do not expect to be, I get all the excitement I need out of my law practice." Mrs. Funk really grew up in the law office and courtroom. Her father practiced law at Dwight, Ill., and when he died she went to live with her uncle. C.C. Strong, at Pontiac. In her uncle's law office she began her studies, simply because she was fascinated with the business and not because she ever expected to enter the profession. In time she was married. After her two daughters were born she moved to Bloomington and there resumed her studies in the Illinois Wesleyan University. Before she finished her course she decided to take up the practice of law as soon as she was admitted to the bar. Five years ago she was admitted to practice and since then has continually followed her profession. Submitted by Jim C. on Fri, 11/14/2008 - 12:06pm. "Stay close to 'za candles...za' stairway can be tweacherwus!" Submitted by Laurie on Fri, 11/14/2008 - 12:04pm. Ms. Funk -- we owe a LOT to you and your colleagues. Factions in the suffragette movement causing problems ... sounds like problems with 3rd wavers vs. the old league in the contemporary feminist movement. Submitted by T.U.M. on Fri, 11/14/2008 - 11:35am. "_____ is the sweetest _____"
Submitted by Mr Mel on Fri, 11/14/2008 - 7:51am. Lily Tomlin to star as Ms. Funk. Waitin' for the phone to ring. Submitted by Anonymous Tipster on Fri, 11/14/2008 - 3:58am. Submitted by Anonymous Tipster on Fri, 11/14/2008 - 12:15am. Antoinette Funk's costume is up-to-the-minute for 1914. Her severely tailored high-waisted wool skirt contrasts with the complicated soft layering of silk net and tulle over silk taffeta on her blouse. The tiny silver pin at her throat however is a classic Art Nouveau style "Lady Face" pin, a young woman's face framed by four enormous roses or poppies, and probably dates from around 1904, the year Mrs. Funk was admitted to the Illinois Bar. Submitted by Angel on Thu, 11/13/2008 - 11:48pm. Looks interesting with those side seams. I'm curious as to know how comfortable it'd be and to see how it's constructed. On a side note, Mrs. Funk looks like she hasn't had a good night's sleep in a while. Despite this, she looks remarkably well put together. A woman I would like to have known. Submitted by Anonymous Tipster on Thu, 11/13/2008 - 11:31pm. More than most, Mrs. Funk seems to look straight through the camera lens into the eyes of the viewer. Her forthright, no-nonsense demeanor must have helped to disarm many opponents in the courts and in the bureaucracy. Her straight-backed posture as she rotates to her right to rest her arms on the desk surely reinforces our impressions of her character, yet that ramrod posture is the product of her very constricting corset, which allowed no sideways bending at the natural waist and very little arching of the low back. She must rest against the desk like a ladder resting against a second floor window ledge. Many photos of women taken during these years show similar physical accommodations to the unseen engineering beneath their clothes. Submitted by DoninVa on Thu, 11/13/2008 - 10:58pm. ... to Ms Funk. My 18-year-old daughter voted for the first time last week. Submitted by ninabi on Thu, 11/13/2008 - 10:06pm. Ms. Funk gave a speech at Bryn Mawr titled "The Best Arguments for Woman Suffrage" a year after this picture was taken. She died in 1942. She was also featured in a N.Y. Times article where she commented that a faction within the suffrage movement was causing a setback. Mrs. Funk's photo popped up on amazon.com (side profile) and she apparently did work with Liberty Bonds during WWII. Submitted by Loquacity on Thu, 11/13/2008 - 9:54pm. Oh wow. What an amazing picture. She looks so together, so organised, so in control. The look on her face says "OK, take your photo. But no monkey business!" I wanna be her when I grow up. Submitted by Anonymous Tipster on Thu, 11/13/2008 - 6:42pm.